There are five influences that we have found in determining priorities in life. Obviously, there are more impacts than these; however, these are the five that have guided us through the years. Like everything else we have learned and applied in our lives, these were learned from others (especially through Gregg Harris Seasons of Life seminar)—for which we will be eternally grateful. Hopefully, you and your spouse have the same goals in life. If that is the case, then you both want the same things: to live lives that please and honor God; to have godly, well educated children; to make a difference in the world; etc. But there are so many ways to please and honor God; there are so many ways to educate our children; there are so many ways to make a difference in the world. 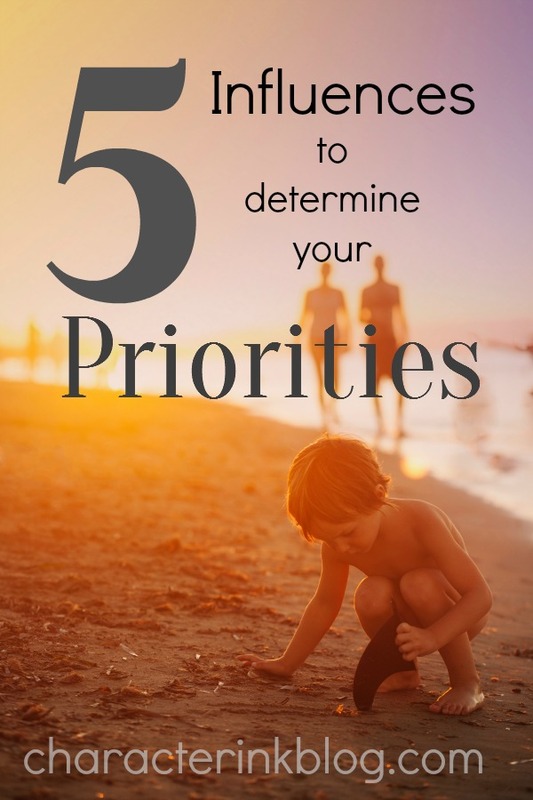 If you and your spouse are on the same page with your priorities, I recommend that you go through the rest of today’s and tomorrow’s posts about determining priorities together. Talking through your goals, dreams, and visions together will help to further solidify your priorities–and what you should be spending your life on. Many things that should be our priorities are staring us right in the face, literally. God has already placed people in our lives that are built in priorities. They are already there–they just need to be prioritized. For example, if you have children and a husband, these are boundaries–built-in priorities–that should take precedence over other things. They are placed in your life by God Himself. He is giving you ready-made priorities and is just waiting for you to put them high on your priority list where they belong. Another built-in boundary that aids in prioritizing is that of talents and skills. As we recognize talents and skills that God has given us, we can safely assume that God wants those as priorities in our lives–or wants to use them to help us reach those priorities. Your skills and talents were given especially to you. When my older children were younger, I always wanted to do and be something other than what I was. I especially envied other people’s talents. For instance, I saw musical families and wished that we could be musical. I wanted all of us to be up on stage somewhere playing instruments together. However, I was not given the skills of music, nor were Ray and many of the children. Using the skills that I have, rather than wanting others’ skills, saves time and gives me more energy to meet the priorities God has given me. We have chosen to focus on the skills that God has given our family: some are intellectually gifted; most of us are organizers; we are all communicators (in writing and speech); we are all leaders. By focusing on those skills, rather than skills that we do not have, we can meet our priorities more efficiently and more excellently. Yesterday I described our first “priority purge.” Our next “priority purge” came a few years later when we had two small children. God led us to attend two awesome, life-changing seminars: The Christian Homeschooling Workshop and the Advanced Homeschooling Workshop, both by Gregg Harris. From these seminars, among many other things, we learned about seasons of life. A season of life is that time period you find yourself in based on your age, your family situation, etc. We discovered that we were not being as effective as we could be in our lives because we were trying to do things out of our season. At that time, according to the workshop, we were in the “Business and Babies” season. We stayed there for many, many years! Yet, we continually found ourselves involved in activities that were for those of the next season. Ray was on the hospital board in our town, he was an elder in our church, we taught Bible classes at church to people three times our age. We struggled to find time to attend meetings, serve in the church thoroughly, prepare our lessons, etc., due to Ray’s heavy work schedule and our responsibilities with our young children. We came home from those two seminars and went through another priority purging. Due to the season that we were in, we decided Ray should resign from his hospital board and elder positions. We also cut back on our teaching at church. After all, we were still in our early twenties. What business did we have telling others how to live their lives when we lacked the wisdom that we would obtain through years of experiences? Another priority purge helped us get closer to our God-given priorities for that season. So, not only do we have built-in priorities because we have children to raise and a spouse to love and encourage, but the ages of those children and spouse further solidify our priorities, usually also based on the season of life we are in. When I had five children ten and under, I loved homeschooling and communicating so much that I wanted to write and speak about homeschooling. I saw others doing it, read others’ books, etc, and I felt that I had a lot to offer homeschoolers since I had been a teacher, had been homeschooling for several years, and had, had many experiences helping homeschoolers get started. However, learning about seasons of life helped me to see that it was not time for those things. Maybe I did have some built-in boundaries of skills (speaking, writing, and communicating). Maybe I did have the motivation due to my love for homeschooling. However, the other built-in boundaries of so many young children, my season of life, the lack of experience for myself, etc., showed me that it was not the right time for that priority of communicating with larger groups of people yet. And taking the whole built-in boundaries concept one step further, we find that even natural seasons of life (winter, spring, summer, and fall)–when combined with the built-in priorities of people, talents, and life seasons–help us determine our priorities. Priorities and schedules are fluid, not stagnant. They change constantly, especially when we have young children. For example, in the fall, we might have a newborn baby who nurses and sleeps, giving us a lot of time to school the kids, do the housework, minister to other women, etc. However, two natural seasons later, in the spring, that same sleeping infant is a curious, crawling toddler, altering our schedule and, in effect, our priorities! Suddenly, we do not have the long hours to read around the table with everyone in attendance. If we still have the priority of reading together, we may have to limit it, prioritize the training of that toddler, or read in groups so someone is available to look after the little tyke. A natural season of life affects our priorities, and we have to decide how to handle it, what our priority will be for that season, etc. Each year, new priorities pop up. Maybe you haven’t had a new reader for three years, and now your “caboose” needs daily reading instruction, time that had formally been given to other things. A natural season (i.e. a child in first or second grade) influences your prioritizing. Yes, new priorities will emerge, but the decision to make something a priority and delete something else should be a conscious decision, not a decision that is made for you by outside forces.